Abdoulaye Camara hails from the West African nation of Guinea. His ability to embrace students of all levels and backgrounds marks him an exceptionally gifted teacher and ambassador of his heritage. With over thirty years of experience as the artistic director of Allatantou Dance Productions, based in the Scandinavian country of Sweden, he has traveled the globe bringing the vibrant performance traditions of his homeland to audiences and students worldwide. Abdoulaye spent the first ten years of life by the side of his grandmother in a village named Yinguiakhori. From infancy, Abdoulaye’s ‘grandmom’ held him as women traditionally do in Africa, on her back as she worked, sang songs, and told him stories. This experience left a positively indelible mark on this young boy. By age ten, Abdoulaye moved to the capital city of Conakry in order to attend better schools and to be with his parents and siblings. During this time he became heavily influenced and intrigued by both traditional and popular music and dance artists of the time, and began to seriously seek master teachers to study. His spirit and determination led him to learn from the late, great master artist, Bangaly Bangoura a twenty-five year veteran of the most celebrated dance company from Africa, Les Ballets Africains; with ‘everybody’s teacher’ of West African dance - the beloved world renowned, late Sekouba Camara; and with the very talented master dancer and drummer, Moustapha Bangoura, a 25-year veteran of Les Ballets Africains. At seventeen, Abdoulaye was eager to travel abroad to different west African countries with the drive and discipline to study more about African cultures, especially dance and music. He made courageous treks to Sierra Leone, Liberia, Senegal and The Gambia. It was in The Gambia that he established the twenty, plus, member performance group, Allatantou Dance Productions, which quickly became sought by the local tourist industry to perform in five-star venues in the city of Serekunda. From there, Abdoulaye and fellow artists of his company were invited to perform in cities throughout Great Britain, Switzerland and France. In 1990, he moved to Sweden, starting in Stockholm and eventually moving to the north of Sweden where he continues to bring the richness of his culture throughout Scandinavia. In 1993, Abdoulaye was invited to teach intensive workshop classes in the United States and since that time has established a twenty-year base of students, many of whom are teachers themselves and who belong to popular dance and music performance groups. He is a fun teacher, with the expertise of working with elementary, middle, and high school students, university level ages, as well as senior citizens. Each year he offers his students the opportunity of an enjoyable cultural exchange with master dance and drum artists from Guinea. These workshops take place on Roume Island, off the coast of capital city of Conakry. Abdoulaye is happy to share his culture with anybody who has the desire and willingness to learn. He is known for saying, ‘the African dance and music is great spiritual medicine - anybody can try it and experience the happiness it brings! 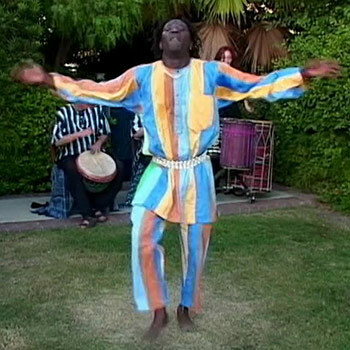 Dancing with Abdoulaye is Nikola Clay, who also co-produced and edited the video recordings.